A delightful children's book landed on my desk today. It's called Melanie & Tommy have two pet rats and one syndrome. 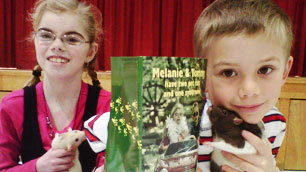 It's narrated by Tommy, 6, and follows his adventures with sister Melanie, 9, as they push their pedal car around their Ontario farm and rely on two pet rats to get them out of trouble. Tommy came up with the book idea when friends made fun of his sister, Melanie, who has Cornelia de Lange syndrome, a genetic condition. Listen to this CBC radio interview or visit the family at http://www.2petrats.com/.